Perfect for those who carry their Bible with a sense of style. Gold foil edges and large, easy-to-read print are a visually pleasing way to find favorite Scriptures. 84 gold foil-edged tabs for Bible from 7 inches up to 12 inches. Set includes: Old and New Testament tabs, special notation tabs and a Life Verse tab. Bible Tabs Large Print Traditional Gold by Ellie Claire was published by Ellie Claire in April 2009 and is our 2419th best seller. The ISBN for Bible Tabs Large Print Traditional Gold is 9781934770931. 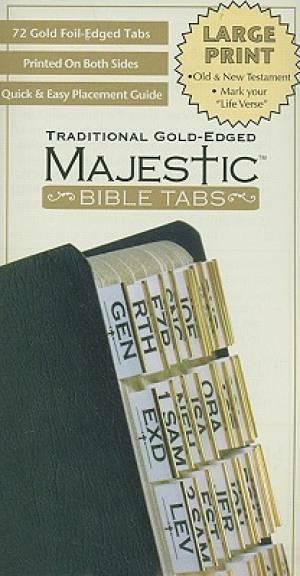 Be the first to review Bible Tabs Large Print Traditional Gold! Got a question? No problem! Just click here to ask us about Bible Tabs Large Print Traditional Gold. If not, then what size of Bible? A:Yes, these tabs are made to be used with any size Bible. Thank you for using the Q&A Forum.